Tyler Rosenlicht, Vice President, is a portfolio manager for Cohen & Steers' infrastructure portfolios with an emphasis on MLP and Midstream Energy strategies. He has seven years of investment experience. 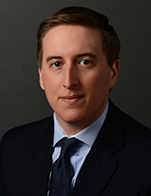 Prior to joining the firm in 2012, Mr. Rosenlicht was an investment banking associate with Keefe, Bruyette & Woods and an investment banking analyst with Wachovia Securities. Mr. Rosenlicht has a BA from the University of Richmond and an MBA from Georgetown University. He is based in New York.